Few musicals have taken off in popularity the way that Hamilton has. The hit show about founding father Alexander Hamilton has been going strong on Broadway for two years and the original cast recording has gone platinum twice. The story begins with a narration by Aaron Burr, played here by Leslie Odom, Jr., who describes himself at the end of the first song as “the damn fool that shot him.” The introduction, Alexander Hamilton, tells the story of Hamilton’s tragic upbringing and his immigration to the United States, setting up his involvement with the American Revolution. The themes of friendship, revolution, toil, and arrogance ring throughout the musical. Ambitious as can be – Miranda described the titular character as a Slytherin when asked about his Hogwarts house – Hamilton is quick to make influential friends, including Aaron Burr, the Marquis de Lafayette, and George Washington. Burr, as most likely remember, was later Vice President of the United States – the post that he held when he and Hamilton dueled in 1804. I will say that I am not much of a hip hop fan. This was one of my first forays into the genre, and it was a good introduction, indeed! Miranda’s writing combined with music by Alex Lacamoire is catchy, witty, and holds the attention of five and fifty year olds, alike (However, while my children enjoy the clean version of the soundtrack, it’s not something that I’d recommend for all children!). Check the PPLC catalog for Hamilton (Original Broadway Cast Recording). Categories: Biography, Clever dialogue, Drama, Historical nonfiction, Music, Nonfiction, Politics, Tearjerkers, Toni's Picks, Uncategorized | Permalink. Ari Mendoza is fifteen years old during the summer of 1987. He lives in El Paso, TX and has few friends. His mother is a teacher and his older siblings are grown up and out of the house. His twin sisters are mothers and are 12 years older than him. His brother is in prison. His father is a Vietnam veteran, though he never speaks of his time in the war and he and Ari rarely speak at all. Life for Ari is pretty isolated until he decides to make a decision that is his and his alone after going with the flow or just doing nothing for his entire life. He rides his bike to the public swimming pool, despite not knowing how to swim. It’s there that he meets Dante. Dante is unlike anyone that Ari has ever met. He is intelligent, kind, and adores his mom and dad. Like Ari, Dante is also Mexican-American. Their shared cultural background and loner status are just a few of the similarities that ignite their initial friendship. The relationship between Ari and Dante flourishes throughout the summer until they go back to school. They don’t attend the same school and won’t see each other again until the following year. During their time apart they grow in different ways. Ari has taken a job and has become an angry teen. He wants to know more about his brother, who he barely remembers. He learns to drive and spends time alone star gazing in the desert. Dante, spending the year in Chicago, starts to bridge the gap between childhood and adulthood. During this gap between being a child and an adolescent, Ari and Dante learn about friendship, acceptance, sacrifice, and love. As a teen centered LGBT novel, it deals with the themes of coming out in a place and time where being gay was not seen as an easily acceptable concept. It also goes into gender roles, specifically masculinity, as well as artistic expression, family secrets, and intellectualism. The book chronicles the summer, school year, and following summer from the perspective of Ari as he exists between the universe of being a boy and a man. It is one of the purest and most sincere relationships to have graced the pages of a YA novel. Sáenz’s characters are well written and fleshed out and their story is so realistic that you might question whether or not you are truly reading a work of fiction. The audio book is narrated by Lin Manuel Miranda, creator and star of the hit Broadway musical, Hamilton. The attitude and inflection with which he reads the story truly feels like an auditory glimpse at the life of two teens in 1987. Check the PPLC catalog for Aristotle and Dante Discover the Secrets of the Universe. Categories: Audiobook, Books, Clever dialogue, Coming of Age, Diverse Books, Drama, Family Issues, Florida Teens Read, LGBT, Realism, Sunshine State, Tearjerkers, Toni's Picks, Young Adult | Permalink. Yamashita, Kawabe, and Kiyama are friends on the verge of adulthood, or at least middle school. With the future looming ahead, the three boys think it is high time they underwent a rite of passage, namely: witnessing a death. For this activity, the boys choose to watch an unkempt old man who looks as if he has one foot in the grave already. Their plans crumble when the old man realizes he is being watched. Proving to be very lively, he browbeats the boys into doing his house work. Yamashita, Kawabe, and Kiyama’s grand rite of passage is ruined, but their journey to adulthood is just beginning. This book is a Japanese import. Fully translated, it still contains some concepts that may not be familiar to American readers. The text explains these things in a way that can be understood and is unobtrusive to the narrative. 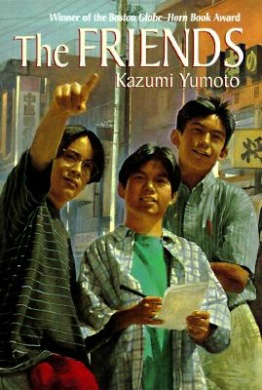 The Friends reads almost like a 1980’s film, making the text easy and enjoyable to read. The story is simultaneously warm, and unsentimental. The harsh realities of life and death are examined realistically, but this is softened by the truly wonderful relationships that develop between the characters. As the story unfolds, the old man becomes a nurturing figure that the three boys never knew they needed. Conversely, the boys bring a spark back into the old man’s life, enabling him to face his past, and his quickly shrinking future. This is a book for readers 10 and up, but has applications for any reader experiencing grief, death, or the existential terror brought on by the passage of time. Check the PPLC Catalog for The Friends. Categories: Beth's Picks, Books, Coming of Age, Diverse Books, Japanese, Middle grade, Plot, Tearjerkers | Permalink. Mia Hall has a pretty good life. She’s just aced her Julliard audition, her boyfriend is essentially a rock star, and her family is so cool it hurts. Senior year is almost over and the only thing Mia is worried about is whether or not her relationship could withstand a long distance move. That is until, while out with her family for a drive, their car suddenly spins out of control and the subsequent crash instantly kills her mother and father. Mia finds herself far away from the vehicle staring down at the wreckage that is her family. She’s horrified and wondering how it’s possible she could be standing, walking at all while her father’s brains are smeared across the road. While looking for her little brother she comes across her own body. It’s twisted at weird angles and there’s blood everywhere. How is this even possible? Is she dead? While the nurses and doctors try their hardest to keep her alive and her friends and family weep over her comatose body, Mia relives the years leading up to these moments. Does she want to keep living when her life has been so utterly devastated? Mia now must face the ultimate choice: should she stay? If I Stay was an interesting take on the out-of-body experience trope: not religious in nature but not quite supernatural either. This book is a perfect quick read for teens and adults and if you liked it there is a sequel! Check the PPLC Catalog for If I Stay. Categories: Amelia's Picks, Audiobook, Book to Movie, Books, Characters, Contemporary Fiction, Drama, Ebook, Family Issues, Philosophy, Quick reads, Tearjerkers, Young Adult | Permalink. Notable for its beautiful music, memorable characters, and surprisingly complex and emotional story line, The Land Before Time is definitely on par with any other animated film produced at the time. Littlefoot is a young Long Neck dinosaur traveling with his grandparents and mother to The Great Valley, a lush paradise safe from the severe drought that plagues the rest of the planet. But when an earthquake strikes, Littlefoot is left to fend for himself against all manner of prehistoric perils. Somehow he must make it to The Great Valley and reunite with his family. Along the way he makes new friends who prove invaluable in his journey. The Land Before Time was produced by master animator Don Bluth, the same person that brought us such children’s classics as The Secret of NIMH, An American Tale, and All Dogs Go to Heaven, among many others. Although, in my humble opinion, Bluth’s films are just as good as Disney’s in terms of narrative power and music production, Bluth’s studio was simply unable to compete with the Disney behemoth and folded shortly after the commercial failure of Titan A.E. in 2000. And yet, Bluth’s legacy is a series of remarkable films that were a Sunday afternoon staple for those of us who grew up in the ’80s and ’90s. As of this blog post, Bluth is crowdfunding a new film on Indiegogo called Dragon’s Lair Returns. Check the PPLC Catalog for The Land Before Time. Categories: Adventure, AnnMarie's Picks, Characters, Classics, Movies, Setting, Tearjerkers | Permalink. Hailing from Japan, this media franchise began with a manga series, and has blossomed into eleven written volumes, two seasons of a television show, and a myriad of merchandise. Here at the library we have all eleven volumes of the manga, and (fresh off the truck yesterday) the first season of the TV show! This is a story I would recommend to anyone who loves cats or cute things. A mother cat takes her kittens on their very first walk outside. Along the way one tiny grey kitten gets lost. Alone, scared, cold, and starving, the kitten cries for her mother to come find her, but the Yamada family gets there first! The Yamadas name the little cat Chi and welcome her into their home. The stories come in bite-size, slice-of-life narratives detailing Chi’s adventures and her family’s harried attempts to keep her existence a secret from their pet-averse landlord. There is no hiding the fact that this TV and book series is targeted towards children, but that does not diminish my love for it. Each story/episode captures cat ownership in a way that will entertain viewers of all ages. The books are translated into English and should be no problem for younger readers. The cartoons are in Japanese with English subtitles, so those who hate subtitles have been warned. This is in all honesty my favorite anime and manga series, ever. It is relatable, touching, and very very cute. There are several chapters/episodes that made me cry, and that is the highest compliment I could ever give to any story. Check the PPLC Catalog for Chi’s Sweet Home. Categories: Adventure, Beth's Picks, Books, Characters, Family Issues, First in a Series, Graphic Novels, Humor, Japanese, Tearjerkers | Permalink. There are hundreds of books about 9/11, but this one stands out. The author, Joel Meyerowitz, is an award-winning photographer that captured not only the immediate aftermath of the September 11th terrorist attacks, but also the intensive rescue missions and cleanup efforts. Interspersed between the pages and pages of breathtaking color photography are poignant essays by Meyerowitz that describe his ground-zero experience in his own words. At first he was denied access to the area, but he slowly gained the trust and admiration of those involved in the cleanup and was soon allowed to photograph the relief effort. Now the photography included in Aftermath is a permanent collection at the Museum of the City of New York. Thankfully, however, you don’t need to travel to New York to see this awe-inspiring collection when you check it out in book form. Check the PPLC Catalog for Aftermath. Categories: AnnMarie's Picks, Books, Essays, Historical nonfiction, Nonfiction, Photography, Tearjerkers | Permalink.